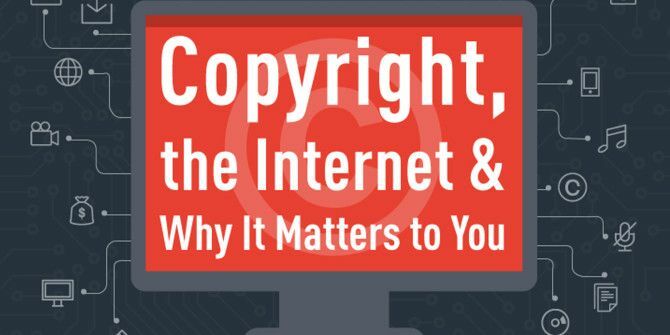 Copyright is a big deal on the Internet, and it has a huge impact on everyone, whether you create content or just read the stuff produced by sites like MakeUseOf. It might not be something you think about on a regular basis, but it’s always there. The image below provides all kinds of information on copyright and why it matters to you. And when you’re done with it, you may want to learn how to type out a trademark symbol How to Create Copyright and Trademark Symbols via Keystrokes How to Create Copyright and Trademark Symbols via Keystrokes This post came about because I was searching for ways to create a copyright symbol for a batch of graphics in Photoshop. Read More and file that away in the back of your mind. Explore more about: Copyright, Infographic. Hello, is it possible to get the original source to translate it in French ? It's a really nice job ! I am using my Quote Facebook covers website... i usually steal covers from other websites... so does it have any side effect on my website?? I work with a gamer site - it is a constant battle to keep copyrighted material off the site. Many of the members have no clue at all about copyright and honestly believe that anything, and especially any music they find on FREE sites are automatically not covered by copyright - after all the site said it was free. Then we have those who do know and, callously upload anyway - based on the "So, I haven't seen anyone sued for it yet" - Stupidly thinking that the rabid copyright lawyers will ONLY try to sue the idiot hiding behind a proxy that uploads instead of the high profile site they upload to. Then whine when they get banned for violating a law, and coincidentally endangering the site. We do try to differentiate between the cluless - who usually get a temporary ban, and the serial violators, and those that just refuse to play by the rules that get a permanent ban. How do u make this type of Graphical things ? i really need to know which software ? plz reply Thanks !